A Northern Ireland council has made an apostrophe gaffe costing the taxpayer more than £1,000. 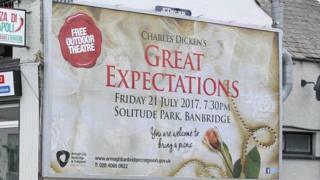 Armagh, Banbridge and Craigavon Borough Council's grammatical error appeared on an advert for a performance of Charles Dickens' Great Expectations in July.. The council chose to reprint its promotional material at a cost, the BBC understands, of about £1,200. A spokesperson said it was the right thing to do as the event was a celebration of a "literary giant". "To promote our outdoor theatre production of 'Great Expectations' by Charles Dickens, we produced a variety of advertising and publicity materials to maximise public awareness of this exciting free event," they continued. "Unfortunately, due simply to human error, a misplaced apostrophe was not picked up." Some £140 was spent on correcting 48 sheets, £95 on delivering additional leaflets, £295 on reprinting advertising boards, £332 on flyers and posters and £290 on a window vinyl. Armagh, Banbridge and Craigavon Council is by no means alone in falling into the rogue apostrophe trap. In February last year, Tesco apologised after making two grammatical gaffes in one two-pack of baby clothing. And in April, the BBC reported on a self-proclaimed "grammar vigilante" in Bristol who goes out at night correcting street signs and shop fronts which display misplaced apostrophes.